In Outsider / Insider: The art of Gordon Bennett, the AAMU Museum of Contemporary Aboriginal Art will present a selection from the wide-ranging oeuvre of Gordon Bennett, who is regarded as one of Australia's most significant contemporary artists. Gordon Bennett (57) has had over sixty solo exhibitions and his work was shown at the Biennales of Venice, Sydney and Shanghai. His works are also included in over 100 art collections, including those of Moet et Chandon in Eparnay, the Australian National War Memorial, Brisbane Boys and Girls Grammars, the National Gallery of Australia and all State Galleries. Outsider / Insider is his first solo exhibition in a European museum since 2000 and runs in Utrecht until 9 December. Bennett can also be seen at Documenta 13 in Kassel. His Indigenous heritage made Gordon Bennett an outsider throughout his schooling and working life, and early works bemoaned the loss of connection to his traditional culture caused by his Mother's removal from country to the prison-like Cherbourg settlement. But, after 10 years with Telstra then art studies, his practice soon drew the attention of the art media, galleries and museums. One of his earliest works, the monumental Outsider (1988), in which he quotes paintings by Van Gogh, won him selection for the important Perspecta exhibition just a year after leaving art school; it's also one of the most reproduced works of art in Australia. Bennett's personal search for identity and his confrontation with overt racism are the basis for international themes in his oeuvre, commenting on issues of cultural identity, colonialism, racism, freedom and the dominance of Western history - including art history. “He exposes the culturally constructed nature of perception – especially the artifice of European vision”, according to essayist Dr Susan Lowish. And Bennett often achieves this by appropriating world-famous images from art history, quoting artists such as Mondrian, Van Gogh, Basquiat and Pollock. He has a deep admiration for these artists, enters into a direct dialogue with their work, allowing him to confront the public with a different, penetrating and often ironic view of Western art history, and history in general. In his Home Décor series, Bennett recycles the stylised Indigenous Australian figures of Modernist artist Margaret Preston and weaves them into Mondrian-like rectilinear grids, stripping them of all meaning. 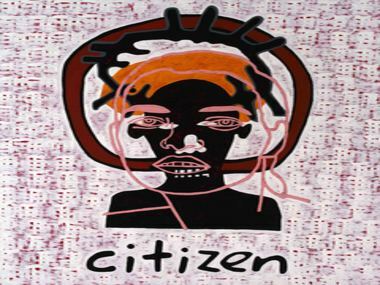 These works can be seen as a condemnation of her kitschy use of Indigenous imagery and a harsh criticism of the history of race relations both in Australia and in the West. 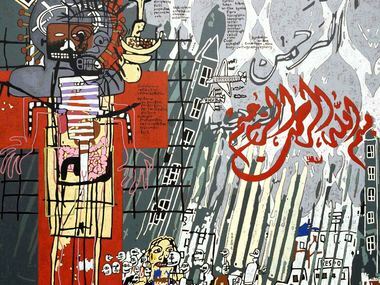 He feels a close affinity with African-American artist Jean-Michel Basquiat and in the Notes to Basquiat series seeks an international context for his themes. After the events of September 11 2001, the American association lead on to the acclaimed 911 series. His most recent artworks focus on abstraction. In his Abstraction series he returns to Basquiat's graffiti style and his double portraits include outlined drawings of random celebrities such as Taylor Swift and Kate Moss. A substantial catalogue in English will be published to accompany this exhibition. In addition to images of all the works in the exhibition, the catalogue will contain essays by Prof. Ian McLean, Prof. Kitty Zijlmans and Dr Georges Petitjean, curator of the AAMU (EUR 19.95, ISBN 978-94-6161-056-0, Snoeck Publishers). Hopefully the catalogue will help to restore Bennett to pre-eminence in Australia, where he's been ignored by the two Indigenous Triennials, while his art is appropriated by the likes of the younger Tony Albert. For, as Dr Lowish asserts, “his work is striking and sophisticated and has stood the test of time and repeated interpretation”. The exhibition and catalogue were made possible by the support of QIAMEA, the Mondriaan Fund, VSB Fonds, SNS Reaal Fonds, KF Hein Fonds, Gordon & Leanne Bennett, Milani Gallery in Brisbane, Sutton Gallery in Melbourne and Rabobank Utrecht.